I hate to rain on anyone's parade, but having seen a preview of Oliver Stone's "World Trade Center" with hopes elevated by the review on indybay.org, I was extremely disappointed. Like that reviewer, I was looking for a cinematic subtext which suggested facts contrary to the Official Version of Events (OV). This is the way I approached "United 93", for example, and I found quite a few there (such as the script's indirect acknowledgement that cellphones can't be used at high altitudes.) The few examples of this "stealth truthing" I saw in WTC were far outweighed by an overwhelming number of propagandistic devices that are not going to help our cause. High-profile members of Scholars for 9/11 Truth get shouted down by Sean Hannity, are mostly ignored by mainstream news organizations and have their comments accompanied by the Twilight Zone theme on corporate-owned Air America. So Aaron Haley and Joe Dunlap have come up with a different way to get the word out: they knock on doors and pass out invitations to free movie screenings. Nearly five years have gone by since it happened. The trial of Zacarias Moussaoui is over. Construction of the Freedom Tower just began. Oliver Stone's movie about the attacks is due out in theatres soon. And colleges are offering degrees in homeland-security management. The post-9/11 era is barreling along. And yet a whole subculture is still stuck at that first morning. They are playing and replaying the footage of the disaster, looking for clues that it was an "inside job." They feel sure the post-9/11 era is built on a lie. Wisconsin lawmakers are demanding that a University of Wisconsin-Madison lecturer be pulled from his fall teaching position because of his belief that the Sept. 11, 2001, attacks were not carried out by terrorists, but by the U.S. government. Kevin Barrett, who is scheduled to teach the course "Islam: Religion and Culture," said during a recent talk-radio show appearance that the attacks were carried out by the government to start a war in the Middle East. A decision that many of us were waiting on with baited breath - C-Span's scheduling of the American Scholars Symposium highlights - infuses the 9/11 truth movement with a fresh injection of credibility and exposure to more mainstream audiences. The Austin Citizens for 9/11 Truth group is sponsoring a free event on Wednesday, August 2nd. This event features a lecture by Scholars for 9/11 Truth Full Member Davidson Loehr, author of the acclaimed book "America, Fascism + God", and a showing of the 2005 documentary "Martial Law" at the First Unitarian Universalist Church at 7pm, discussion to follow. 4700 Grover. 452-6168. The focus of this evening is both to explore the events of 9/11 and to put the resulting drastic changes in American life since that day in context. Cspan's schedule now confirms that the L.A. panel discussion on 9/11 will be broadcast Saturday night at 8 p.m. EST. This is the main CSpan channel, not book tv or another, less-viewed, channel (even David Ray Griffin's talk wasn't broadcast on the main CSpan channel). The Sunday panel discussion from the Alex Jones Los Angeles conference will reportedly be telecast on C-SPAN this coming Saturday evening at 8pm and 11pm eastern time. Action Alert: Was 9/11 an inside job? You will have to sign up for a free account before you can vote. We have received a few submissions from people stating that the Colbert forums is a great new resource where 9/11 discussion is permitted (at least for the moment). Sign up and have your say. Les Jamieson was recently interviewed by Ronald Wieck of Hardfire TV, a 'libertarian cable-TV political discussion program'. The interview was on the subject of 'What really happened on September 11, 2001?' and is set to air in two parts on July 31st and August 7th. 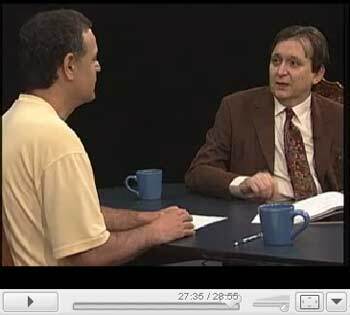 The interview parts are about 30 minutes each and cover a variety of subjects with Les Jamieson advocating alternative theories and Ronald Wieck advocating possible counter-arguements such as those found at 911myths.com. While the interview starts out somewhat reasonable it eventually evolves into little more than an 'I'm right, no I'm right' type of back and forth with Wieck playing the role of the antagonizer. This video was sent in from 911tv.org and was filmed at the '9/11 Revealing the Truth' event in Chicago. You can find more videos from this event near the bottom of the events page on the official site for the Chicago conference.